Special IMISCOE Newsletter - REMINDER Rinus Penninx Award/Registration IMISCOE conference! 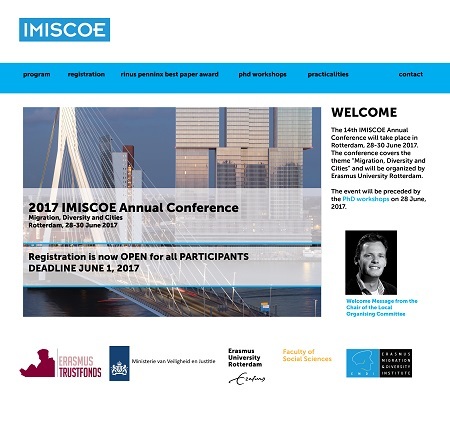 Registration for the 14th IMISCOE Annual Conference in Rotterdam is now open. Registration can be completed via the online conference portal (click here). The conference fee is € 200. PhD-candidates favor a discount of € 50. Deadline for registration is 1 June 2017. Please note that registration is required for ALL participants; also if you have already paid your membership fee (either individual or via your institute) registration has to be done separately. If you have already paid for membership, you will automatically receive a fee waiver via the system. The conference fee includes participation in the conference, lunches, one reception and one dinner. By paying your fee, you will automatically become member of IMISCOE for a one-year period (read more about our membership policy). UPLOAD YOUR PAPERS: Participants can now also upload their full papers via the conference portal. The abstracts of all conference papers are already available for all registered conference participants on the IMISCOE website. The Rinus Penninx best paper award in honour of the founding father of IMISCOE, is an annual award for the best paper submitted to and presented at the IMISCOE annual conference. The award is sponsored by the journal Comparative Migration Studies. An anonymous review committee decides on the allocation of the award. Besides the honour of receiving the award, the prize winner also receives € 750.-- and the opportunity to publish the paper in the journal CMS. To be eligible for the Rinus Penninx Best Paper Award, please submit your paper before the 21th of May by uploading your paper via the website or send your paper to the chair of your panel. Chairs can nominate full papers and are not restricted to the number of nominations. Only original, non-published papers are taken into consideration for the prize. When a paper has more than one author, an authorship note should be added in which the role of each author is explained. In case information on conveners and/or chair is not available in the programming of the 128 conference sessions, the submission will have to be sent to Warda Belabas (belabas@fsw.eur.nl). The deadline for submission for the RPBPA is 21 May 2017. On the 2nd day of the Rotterdam conference - Thursday 29 June: 19.00-19.45, IMISCOE organizes a meet-the-authors book panel, which contains an interactive discussion, chaired by Steven Vertovec, with several authors who have recently published a book in the IMISCOE-series. The book panel will be followed by a wine reception. Do you have a book manuscript in search of a publisher? Is your latest workshop fit to become an edited volume? Have you just defended your thesis and seek to turn it into a monograph? Come talk to the IMISCOE Editorial Committee. Get information and advice on publishing with the Springer-IMISCOE dedicated series! We shall have special OFFICE HOURS at this year’s IMISCOE conference from 12 to 15 hours, next to the registration desk!